july 17, 2000. I read the July 3 San Francisco Call the other day and enjoyed it very much. I do have a quibble. At the end of your excellent cover piece [Dancing on the brink of the world] you say, "But souls are fragile constructs, easily smashed or stolen." I disagree. I think souls, real souls, are pretty durable entities, able to endure injury, survive damage, heal themselves and go on living. In my experience, the phrase "the soul of San Francisco" isn't a metaphor. When you cut through all the tourist hype and restaurant ads and City Hall BS, San Francisco has a real personality. Not to get too metaphysical about it, I think the place is alive. When I first got here in 1977, it was like moving to another dimension and I knew it the moment I saw it. Tales of the City and all that. Magic around every corner and down every street. I read everything I could get my hands on about the history of San Francisco. I think the thing we call San Francisco has been here since they threw the third plank down. It burst into being in a matter of months and it's always been the same since. I would read about the characters who put this place together in the 1800s. It was like reading about the people I was seeing and meeting every day. Not in external particulars, but in essence. Spirit. If people make a city, the San Francisco we know and love was here in 1849. Those people were us. Ungrammatical but true. I had a few sips of fifty-year-old Caen the other night. A different world. A white, blue-collar town, pre-TV, pre-hippie, pre-Pride, pre-dot.com. But the same place. Herb wasn't making it up. He knew his town because he walked it and saw it and talked to it. The San Francisco he loved is the one I love. Whatever it is, it's still here, still alive, and it's been alive every day I've lived here. Souls have to struggle to be themselves in the world. There are always dark spots, mistakes made, things that could be better. The Twin Peaks pictures in your issue certainly make that point! But if this were someplace else, you wouldn't even be able to see Twin Peaks by now. There'd be thirty-story apartment towers right up to the top. So things could be worse. And they will be better. I'm confident of that. If we can't do it here, it can't be done. 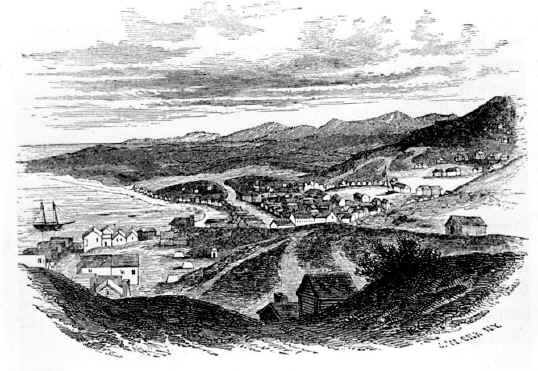 San Francisco in 1848 - before they threw the third plank down?